I spotted this confection at the Chicago French Market. I assume that this pâtissier only intended that a chocolate Buddha confection would sell well; I doubt any deliberate offense to Buddhists. Even so, this is perhaps too fine an example of Buddhism consumerized and ingested as such. Not quite the traditional Dharma Burger, but I would still put it in the same category. "After the ecstasy, the calories." 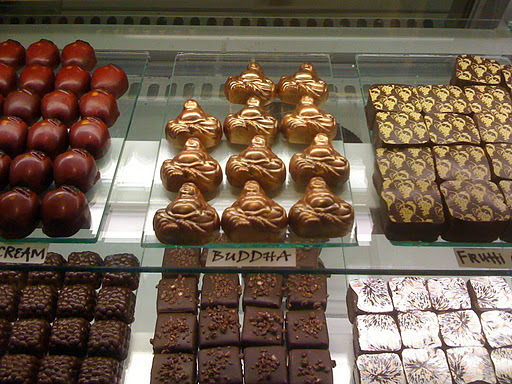 What I find funniest about that photo is that those chocolates were obviously made from some sort of Buddha mold, which I have a hard time believing was custom made. Where do I get my wholesale Buddha molds, in a variety of sizes? I find it silly that they're called "Buddha" while the chocolates next to them are called something cream... what does a Buddha taste like i wonder...?